The Department for Infrastructure is consulting on their proposal for a cycle path along Middlepath Street. On Bikefast Jonathan has done an excellent analysis of the plans. One area where the current plans are a let down is the use of shared space to feed the path through the limited span of the Bangor railway line. This could be an area of conflict between cyclists and pedestrians. I do not think enough has been done to resolve the issue. Across Belfast shared space has been used to fudge areas of conflict. We see it at both ends of the Alfred/Arthur Street cycle path and at either end of Durham Street. 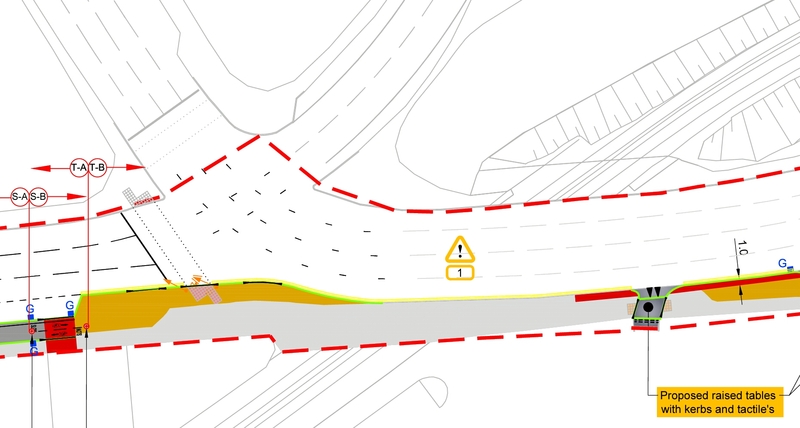 Will the Department use coloured tarmac, signs or lines to nudge pedestrians and cyclists to pass without conflict on the dark, narrow footpath? I propose a bolder solution. The slip road coming off the M3 starts out as a two lane road. Before the signalised junction it splays out to four lanes. 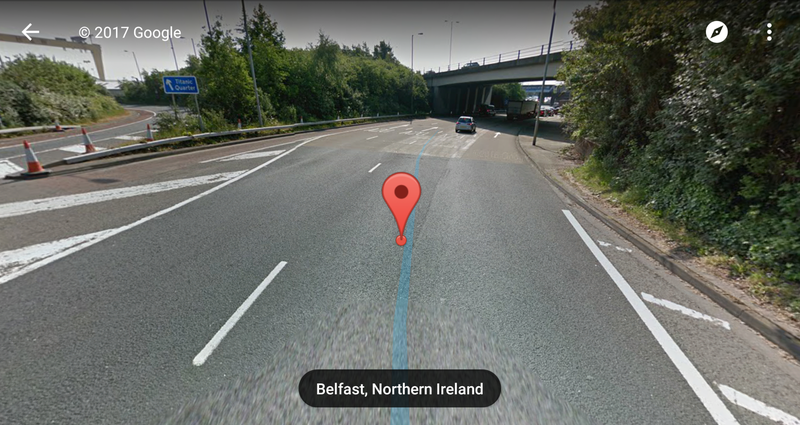 These lanes, eventually, split completely at the junction with the Newtownards Road, where the left hand set of lanes peel off. What if we only allow the two lanes to splay to three before the Middlepath Street junction and use the space for the cycle path? After the railway bridge sufficient space exists to go to four lanes, the cycle path and a separate footpath by using a strip of the adjacent grassed area. Cyclists could go on the road side of the pillars, as viewed in the screenshot above, pedestrians to the right of the pillars. This would be bold. Taking space from Middlepath Street will be relatively easy compared to taking space from a Motorway slip road. But what better way to announce to drivers coming off the M3 that on Belfast’s streets they are not the only road users. It probably won’t get done at this stage, but there is no harm in suggesting it. I’m a critic of excessive space for queuing where it only merges back into a lower capacity road, but this example has full continuation of the lanes through and the clear split of two lanes for each onward direction. It would be hard to see any reduction in lane count being workable for that intersection while the roads beyond have such a large capacity. 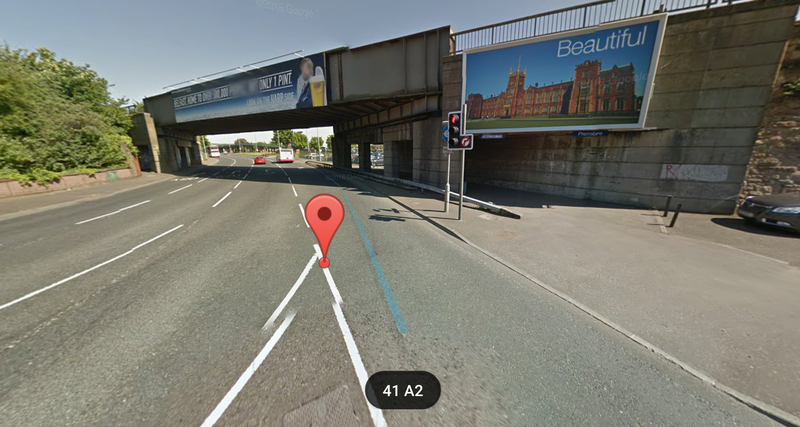 A fair enough comment if you zoom in on Middlepath Street and not consider what happens on A20 Newtownards Road. There those two lanes merge into one at the junction of Ballymacarrett Road.